FOR Justin Puruntatameri, almost 90 years old and the newest art star on the verdant Tiwi Islands, life's retrospect looks like a long adventure movie, rich in strange characters and flickering, fast-changing scenes. There are the Macassan trepang fishermen who came to Melville Island when he was a boy, taught him their fluid language and boiled their rich harvest of sea-slugs in copper cauldrons on the shore. There are the Japanese pearl-lugger captains who snatched him up and sailed him out to diving reefs far off in open seas. There are the Catholic nuns who descended on his country and set up their neat mission home at the headland of Garden Point. He can still see in his mind's eye the bombers flying overhead on their way to destroy Darwin seven decades ago. He can still picture the old mission boat he crewed, St Frances, which made the run down the gulf coast to the Port Keats landing and paid pound stg. 5 for each trip there and back. But more than all these sights and sounds, Puruntatameri remembers deeper, more traditional things: the dances and the songs and the ceremonial secrets his father, Maralampuwi, taught him decades ago. How closely he listened. He can still hear Maralampuwi explaining to him that in time he too would be a maker of carved poles and would make hunting spears from stringybark. "And I decided to begin making these paintings I make today because my father painted these designs, and I am old now, in my turn, and we must remember, keep memory alive." way in paint. He strolled into the little Munupi Art Centre, which was newly under the tutelage of one of the great co-ordinator pairs of the north, Terry Larkin and Rachel Burke. Munupi had been going through hard times, for a range of elusive reasons. It was on the way back up; there was an energy about the centre and Puruntatameri could feel it. It already had its handful of established art-world celebrities, such as the ultra-glamorous Nina Puruntatameri and Susan Wanji Wanji, whose work bridges Tiwi and mainland styles, but there was no one painting there of Puruntatameri's stamp. He embodied the old, pre-contact cultural tradition of the islands, a realm where ceremonies lasted for weeks, and poise and beauty in the dance was the ultimate accomplishment. Puruntatameri settled into his seat at Munupi. Burke watched and was overwhelmed. He took up a black canvas, sombre, nocturnal, on which a tracery of straight lines appeared, glinting, silvery, like the filaments of a spider web and against their gridded network strong diagonals of ochre colours, red and golden-orange, were soon superimposed. The look was unlike anything she had seen on the islands. It was the height of austerity, bare, stripped back, yet there was an intricacy in the patterning, a delicacy in the fierce angles and crossings of the lines. It was easy to sense that rhythm lay at the work's heart. Rhythm in dot and line, the special trademark of Tiwi master painters such as Kitty Kantilla and Timothy Cook, was shaping and defining Puruntatameri's initial work. He painted with a will. In the 18 months since those first canvases he has poured out 80-odd large-scale pieces, despite the disruptions posed by a series of familial disasters. What is the special place that painting fills for such a man? Is it the performance of culture and the claiming of authority in a new field, before new audiences? Is it the delight of nostalgic return to old life paths? With his daughter Pauline and several generations of younger descendants gathered around, Puruntatameri leans back on his veranda and hints at the energies alive in his works. They show the landscape of the past, of course, old days, days of cultural strength, but that landscape is still there and the life patterns it once dictated are still in Puruntatameri's thoughts. Those pale lines of silvery-white are the paths of the crocodile or spiders or hermit crabs. 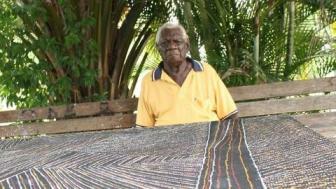 The bands of variegated ochre are the tracks made by different Tiwi groups or, in some paintings, they represent the gleam of coral caught by moonlight. And the geometric pattern of Puruntatameri's largest, most elaborately conceived canvases depict a primal scene that stays constantly in his thoughts. It is the life-design of old days on the islands. It is a social map showing that world. Before buffalo shooters and missionaries made Tiwi country their sphere of operations, the islanders had lived largely on their own terms for several thousand years and had evolved a ceremonial system centred on the last days of the wet season. During the long months of the dry, they lived a nomadic life, moving through the landscape, seeking new campsite waterholes. Each group had a spotter who would travel between set landmarks in search of fresh hunting grounds. He would climb trees and look for the telltale signs of flocking birds. This figure was a map-maker. He held a schematic version of the country in his head. Landmarks were conceptualised as triangles, rockholes were round. Hence Puruntatameri's map paintings, with their jet-black backgrounds and pale pathways strung between a range of triangles and the odd ochre circle, edged with white and yellow, for the gleam of water against the surrounding clay and sand. What knowledge is coded in such art. When Puruntatameri was being schooled in his country, he learned that when the storms and lightning came the female saltwater crocodiles would swim up the island's winding, sluggish rivers to lay their eggs -- and a week later, the Tiwi would make their stealthy way upstream to raid the nests -- they still do so to this day. (Interesting taste? "Yes!") The whole country was a set of tracks, patterns and fields of influence. This area was the realm of the crocodile, this the country of the tern. They overlapped, they had their stories, their mythologies and their coded meanings, and a man's path towards maturity was the path he took in amassing such tales and enacting what he knew. It was a world of constant ceremonies and their finely crafted decorations. Chief among those decorations were face and body marks, ochre-painted, elaborate. A true man was a painter and a bearer of symbolic ochre signs. The measure of a man's mastery was the way he held himself; the grandeur and the glamour of his art was the core of his being. It found its ultimate proof, and ultimate release, in the funerary poles that are still viewed today as the summit of Tiwi creativity. Those tutini grave posts, the emblems of the famous Pukumani ceremony, were, for most of the 20th century, the best known and most keenly collected of Tiwi carvings. Early explorers of the islands had found them in the bush, large-scale sculpted forms of ironwood, their painted decorations eroding in the monsoonal climate, fading, passing back into the landscape. It was the fashioning of these carved poles that Puruntatameri first learned from his father. He made them in his turn. He became a master. The vocabulary of lines and colours and esoteric meanings carried on the grave poles rests in his mind, and it is those forms and resonances that are in his paintings now. In their notes on Puruntatameri's work, the co-ordinators at Munupi describe some of the story cycles underpinning his art: the creation story of the first Tiwi family and the arrival of death in the world; the narrative of a father who took vengeance on his sons; the tale of the yam ceremony and its rules. Themes from the murk of tradition. Why, then, does Puruntatameri's art look so disquietingly modern, with its angled cousinage to Cy Twombly and Jasper Johns? "Of course he has been an artist his whole life," says Beverly Knight of Melbourne's Alcaston Gallery, a Tiwi art specialist who was quick to pounce on Puruntatameri's work. And this is part of the appeal: long-established mastery of line and mark transferred in such direct fashion to canvas. But there is a further quality: the special, rhythmic element seems to have a link to the first thought-world of the Tiwi, which Puruntatameri knew in person, when old, high Tiwi language was the means used to order the cosmos, and the bush was full of ancestral voices and totemic powers. The paintings have the sense of coherence that lovers of Tiwi art trace in the work of other members of Puruntatameri's generation, most notably the senior artist Mary Magdalene Tipungwuti, whose black-ground boards seem to issue from the same processes of memory and re-enactment of the past. It is a distinct world captured in paint: the old islands, before the missionaries came, before the tensions of politics and modernity. A world at once precise and geometric in its patterning. A world where time advanced on strict, clean cycles, and strength and elegance were the measure of a man.